This post is brought to you by ALDI. Hello, it’s Kate of two weeks’ past. I wrote this post in advance of my vacation in Morocco. I day-dreamed of this trip while I was perpetually arms-deep in dishes last year. It’s official: My cookbook’s at the printer, and I’m finally getting a real vacation! I should be practicing yoga and exploring Marrakech right now (you might be able to catch a glimpse on Instagram stories). I’m particularly excited about our trip into the markets. I’m hoping to come back with an awesome Moroccan rug, which might be a challenge to get home since I’m already squeezing ten days’ worth of clothing into a carry-on. I can ship rugs over, right? I’ll tell you all about my adventures when I get back. For now, I can offer you a vibrant springtime stir-fry that is both warming and fresh. Asian stir-fries were always a bit of a mystery to me, but it turns out they’re easy to make at home with the help of a little bit of arrowroot or cornstarch to thicken the sauce. 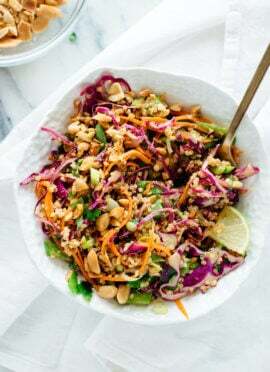 This stir-fry is a flavor-packed side dish, or better yet, turn it into an entrée by serving it on cooked brown rice, perhaps with crispy baked tofu or a fried egg. This is my final recipe in my partnership with ALDI, and I’ve loved all of the meals I’ve made with their high-quality, affordable products. 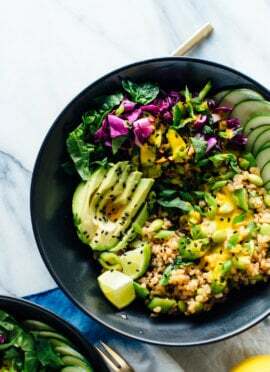 If you missed any of them, be sure to check out my sweet potato and black bean tostadas, broccoli, cheddar and spinach frittata, and roasted mushrooms with herbed quinoa. You can also catch this recipe on their blog. Be sure to visit Hello, Healthy for recipes, cooking videos and resources on how to live a healthy life. I’ll see you at ALDI! 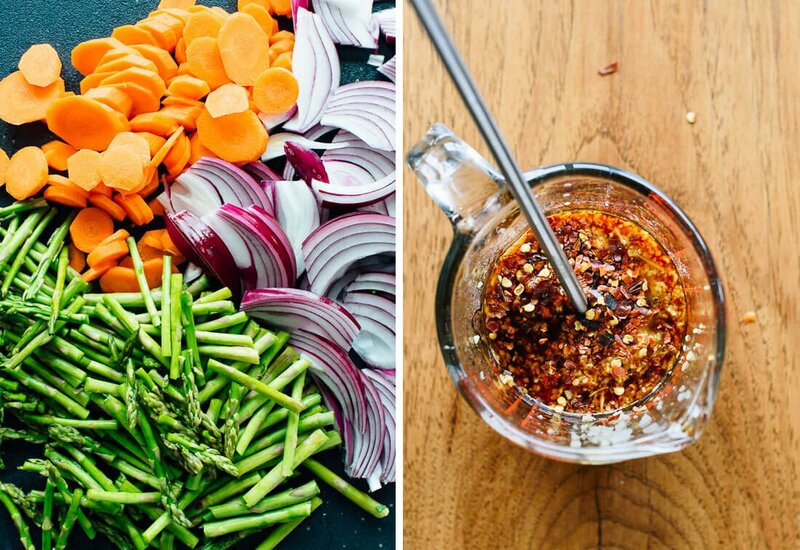 This vegetable stir-fry recipe comes together in no time! To turn this side dish into a complete meal, serve it with brown rice and your choice of protein. In a liquid measuring cup, combine the soy sauce, honey, cornstarch, ginger, garlic and red pepper flakes. Whisk until blended and set aside. Add the asparagus and cook, stirring every 30 seconds, until the carrots are starting to caramelize on the edges and are easily pierced by a fork, about 3 minutes. Pour in the prepared sauce and cook, while stirring constantly, until the sauce has thickened to your liking, about 30 to 60 seconds. Remove from heat and serve as a side dish as-is, or turn it into a main dish by serving it with rice, fried eggs or tofu. 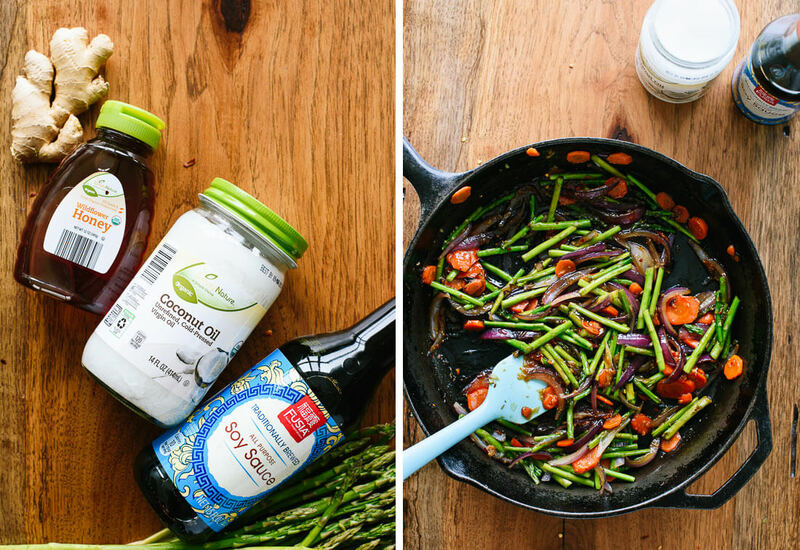 Make it gluten free: Use gluten-free reduced-sodium tamari instead of regular soy sauce. This post was created in partnership with ALDI and I received compensation for my participation. Opinions are my own, always. Thank you for supporting the sponsors who support C+K! Good for you for getting away!!! I can’t wait to follow your stories on insta. Morocco looks absolutely bewitching. This stir fry sauce looks like it’s going to be a staple in my life. Thanks, Meredith! I can’t wait for you to see my adventures on insta. Ahh I’m so excited to see all of your videos from your retreat! 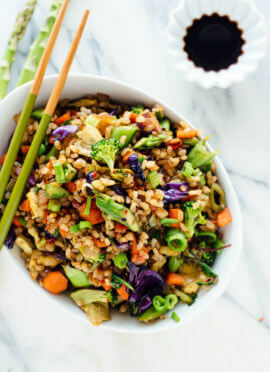 It looks amazing and I’m totally jealous :) I’m a sucker for a good stir fry, so this is going into my weeknight rotation! Thanks, Abby! So excited to share all my photos with everyone once I’m back. Hi there, I am an american/ italian living in Marrakech. Just had some young chefs (girls) around to one of our cookery classes. Thank you, Patricia! Thus far, Marrakech has been absolutely sublime. You are so lucky to call this beautiful place home. This is a really beautiful dish! Enjoy Marrakech & Buy the Rug! I visited last year, also for a yoga retreat, and it is magical. I hope you hike up into the Atlas Mountains. One of my fellow yogi’s found her perfect rug there and they shipped it back to the States for her. Thank you, Dani! I really wanted to go into the mountains, but I was by myself at that point and wasn’t sure it was a good idea. I’ll have to go back. I did bring a rug back, though! THanks so much Kate! Looks delicious. Can’t wait to try it. This is the most colorful stir-fry I’ve ever seen! It definitely captures the spirit of spring. I hope you’re having fun in Morocco! Hey Kate, get the rug! I was recently in India and bought an 8’x10′ handwoven wool rug. I also only packed a carry-on, so was able to bring the rug with me on the plane as a checked bag. I folded it into a square, and then had it shrink-wrapped in plastic at the airport. Weighed 13 kg and was within the size limits in its folded form. Now, the rug looks absolutely gorgeous in my living room and I saved more than $3000 on the cost (if I were to buy it in Canada). Hope you have a fabulous vacation in Morocco. Thank you, Deepthi! I did get a rug, and I did something similar with mine—I had quite a trek ahead of me when I bought it, so I found a big rolling duffel bag for it! Hello Kate, the link to Hello, Healty is not working correctly. Maybe you can take a look at it. Btw tanks for all those lovely recipes. Thanks, Juul! I’ll take a look at it. Oh good gracious, it certainly was not. Thank you for letting me know. I just replaced it with a correct link, no idea what went wrong there. This looks great! I have a feeling it’ll join your Broccoli & Cheddar Gratin as one of my favourite meals. I’m also loving your Kale & Quinoa salad for lunch recently. Do you happen to have a section for freezer-friendly meals? I’m about to get very busy with work but would love to keep enjoying your healthy, homemade meals. I hope you’re enjoying your holiday, and I look forward to getting my hands on your cookbook! Hi Shanice, so glad you’re enjoying my recipes! I’m sorry, I missed your comment while I was away. I don’t have a section for freezer-friendly meals but I want to publish a roundup soon! Kate hi and regards from Cyprus. I made the stir fry today and it was so delicious it finished before I got the chance to take a picture of it. My husband and daughters loved it. Thanks so much. Thanks so much, Elena! I’m so glad everyone enjoyed it. Let me know how it goes, Patsy! What a beautiful blog you are writing! A pleasure for the eyes and palate! A delicious and easy dinner! My whole family loved it. I made it with brown rice and Quorn chicken and it was perfect. Quite enjoyed this! Made it with a rice/quinoa blend and your crispy baked tofu. None-vegetarian husband didn’t want me to steal any from his plate as I normally do. Only thing I’ll do differently next time is scale back the heat a tad before adding the sauce – it thickened immediately. Yes, this one comes together really quickly. I’m so glad you both enjoyed this! Made the veggie stir fry a couple of nights ago–absolutely fantastic! My wife and I loved it, especially the sauce. I added a single head of baby bok choy as well. Tonight, it’s on to Sweet Potato and Black Bean Tacos. You might actually make me a vegetarian! Ha! That may have been my plan all along. :) I’m so glad you’re enjoying my recipes so much, Larry! Made this with your crispy tofu recipe and included some fresh spring peas (that I picked up at Aldi) served over basmati brown rice. Delicious!! It will be included in our regular rotation-Thank you! Hi Kate, I’m new to your blog. Just wanted to let you know that I made this for lunch today—super fast and really delicious! Thank you! I had it over brown rice. You’re welcome, Leslie! Thanks so much for your note. This was simple and easy to make. If you want a spicier sauce, try Kate’s kung pao brussel sprouts. By far the favorite in our house, but this was well-liked too! Thanks, Jenna! I go through lots of experimentation to get the right flavors for my recipes, so I’m glad you agree that the low sodium is the best option. This dish is amazing! The sauce has particularly delicious flavor and spice with the ginger and crushed red pepper!! Easy to enjoy being healthy with this one and several other recipes of yours that I have tried! I’m so glad you loved the spices in the sauce, Carissa! It makes such a big difference with flavor. I thought I had already rated this receipe, but this is going to be my go to receipe for stir-fries! It is so yummy! I didn’t have asparagus (but now that’s it’s in season here, I’m be trying it) and so used green beans. I used it as a main dish so I increased the amounts. Love the ginger in the recipe, really good flavors. Thanks Kate. Yum! Sounds delicious, Malia. I hope you get to try it with the asparagus, too. This was really good. We made it just like the recipe but used ground ginger. The flavor was great (used honey), veggies were done just right n tasted great. We fried two eggs, chopped them up, and served it all over brown rice. It kind of destroyed my non stick pan tho. Maybe from the high heat. Thats the only bad part. Oof, sorry about your pan, Jeff! 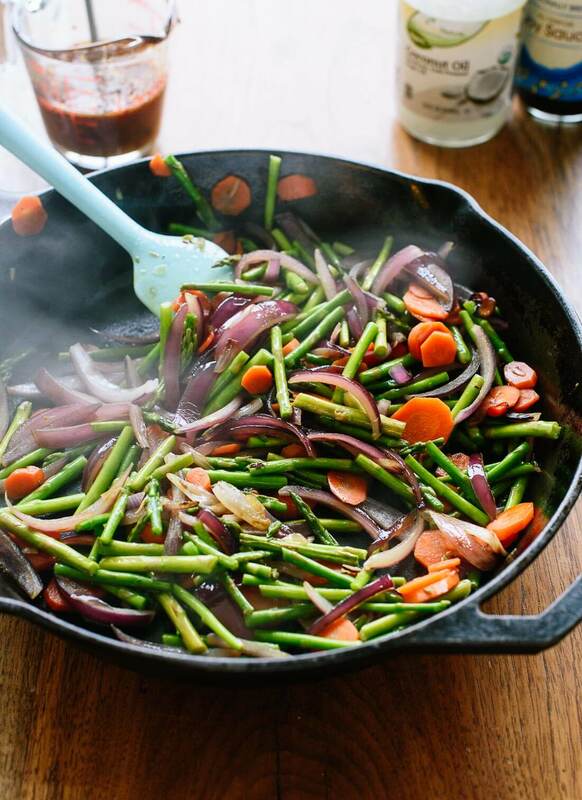 I find a wok or a cast iron skillet works best for this type of high-heat stir-fry. I’m glad it tasted great, though! Tastiest stir-fry I’ve ever made (and, boy, I love a stir-fry). And so simple to make. As always, nothing but the best from Cookie & Kate! This worked beautifully for me! I substituted based on what I had: red pepper, asparagus, and edamame. Really nice with a sprinkle of scallions and sesame seeds on top too! This recipe is just one of the many I have tried and continue to make from cookieandkate.com. And I am excited to say I received my copy of the new cook book! Loving it! So delicious! I love the how the sauce isn’t full of refined sugar. I’ll definitely use this sauce in the future. I served over brown basmati rice with scrambled eggs. Yum! Sounds delicious, Mary. I’m glad you appreciate the sauce, too– it’s my favorite part of this stir-fry. This is soooo good! I have already made this a couple of times. My husband and I absolutely love it. Why go out when you can eat this yummy and healthy food at home. Thank you so much for this recipe! Exactly! I whip this up when I’m craving take-out, too. Thanks, Magda. Love this stir-fry! I have made it several times now, all with different vegetables, and it has turned out great every time. So delicious and full of flavor. Thanks! Yes! This one is great for experimentation and using whatever you have on hand. The perfect sauce! Comes together easily and without fail. I have now adopted your recipe as my go to stir fry. Thank you for the nice addition! Awesome! Thanks a million, Celine. Very tasty and simple! I had all the ingredients on hand and there is just enough sweet that makes me forget it is so healthy. Perfect! So glad you enjoyed it, Liz. I totally give this 5 stars, I had to leave out the onions for one family member but added mushrooms and tofu instead, it was amazing! I have made it twice now to rave reviews. Thank you for this wonderful recipe! Perfect! I’m so glad, Taya. Thanks for commenting! Hubs and I loved this! We used sugar snap peas instead of asparagus since that’s what we had on hand, and we threw in some swiss chard as well. We doubled the sauce (seriously, this sauce is amazing) and added udon noodles and your crispy baked tofu recipe, and it was the perfect amount for 2 nights of dinners and a work lunch too. Can’t wait to make it again! I like that! Sugar snap peas would be delicious and the chard! Thanks for sharing, Julia. Thank you, Rebecca! Thanks for the review. Another delicious recipe, my husband is loving my cooking since i discovered your website! Thank you, Rachael! I appreciate the review. I’m so happy you are loving the blog. This was delicious. The sauce was key. I used different vegetables (green beans and sweet peppers) other than the red onion and it still tasted great. Thank you for sharing. Kate- this was absolutely delicious! Made it tonight after searching online for the perfect vegetarian stir fry for me. This one was it!!! Such a classic combination of flavors and I added a bit more red pepper flakes because I’m a spice lover at heart. DELICIOUS! I will defiantly be making this over and over again. Thank you so much! You’re so welcome, Deisha! Thanks for letting me know how much you enjoyed this dish. I make this monthly, and use blanched broccoli when the asparagus isn’t looking good. It is one of my husband’s favorite meals (we eat it over rice). Thank you for sharing, Naomi! I appreciate the comment and review. So damn good!!!!! Thank you! My stir fry came out perfectly! The sauce wasn’t too spicy and it was just what I was looking for. I added broccoli, carrots, green beans, mushrooms and onions. This will be on heavy rotation at our house. Thank you! You’re welcome, Kathryn! Thanks so much for your review. If you make a bit extra of the sauce, how long can you keep it in the fridge for?? It should keep ok for a few days. Thanks for the review, Sue! Could I use coconut aminos instead of soy sauce? Sure! I know some have tried that and it’s worked fine. Let me know what you think! Tried this and is delicious! Great for a week night when pressed for time or the weekend as an additional dish. Thank you for a great recipe! I loved this. I doubled the sauce and stirred in cooked linguini at the end. I also used sugar snap peas in place of asparagus. My kids said it was spicy, yet kept eating it so it’s obviously good. Lol ty! 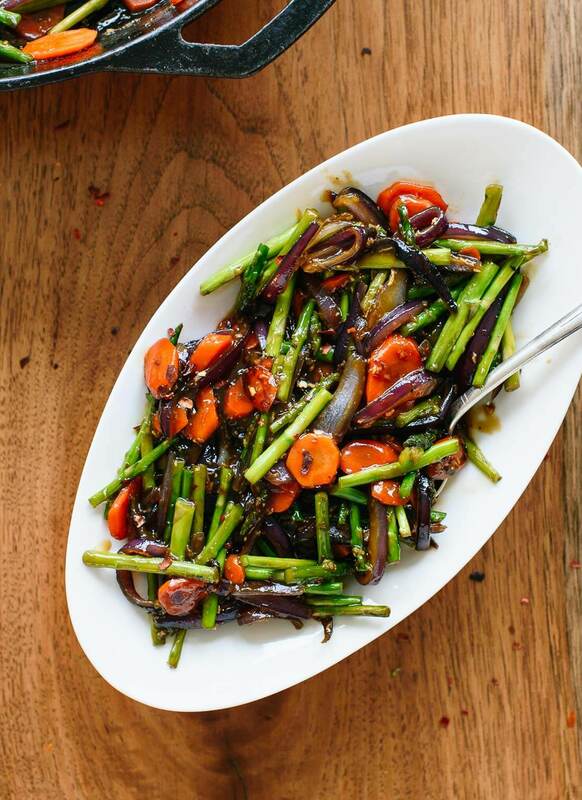 Great stir fried, I love vegetables,your recipes are fun and delicious to cook, this one is excellent.Thanks for sharing, keep up the good work. Thanks for sharing your variation, Carrie! Delicious! Will be in my rotation to make again & again. Excellent flavors. I sauteed some potatoes and mushrooms. To die for! I thought this was a great recipe. Made it for my kids and they loved it! I’ve made many recipes from your site and I am never disappointed. You are a great resource! I’ve passed on your info to many who have all been equally as thrilled. I’m happy you aren’t disappointed, Ian! Thanks for the review. This recipe is a vital part of my spring rotation. I LOVE it, and it’s SO easy!! Thanks! Love to hear that! Thank you, Charlene!